One of my favorite things about our getaway last weekend was that we took a slow and meandering path home. We strolled around a lake in the mountains, and we spent a lovely afternoon in the little town of Redlands. 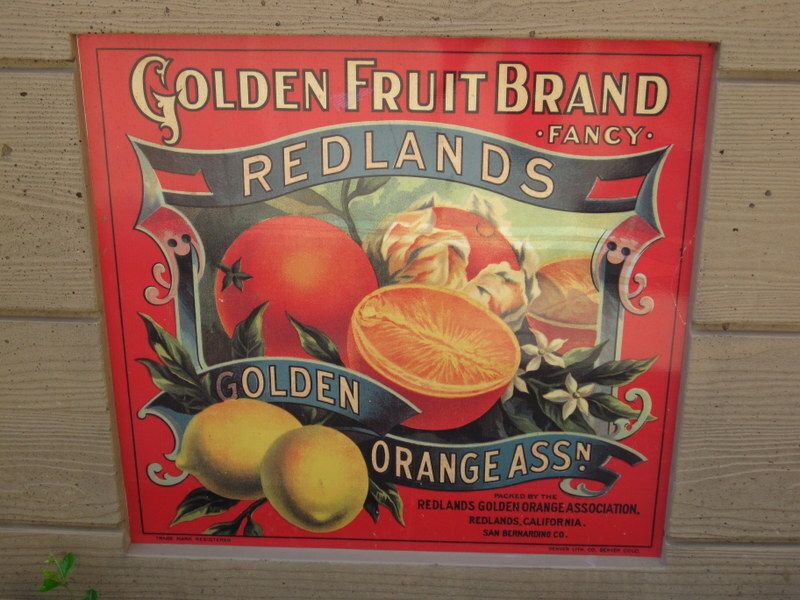 Redlands was once an orange grove town, and it has a really palpable sense of history. I just love that. 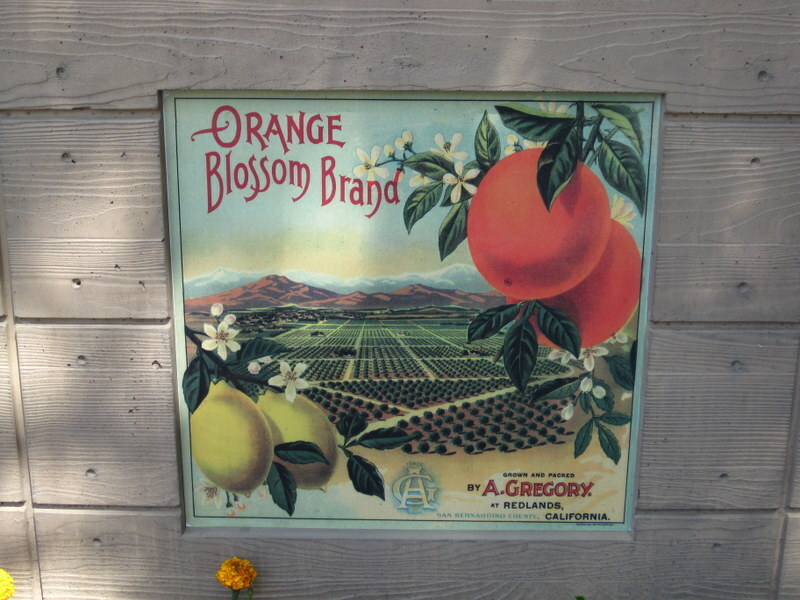 The downtown area has lots of charm, found most especially in these old citrus signs posted here and there. 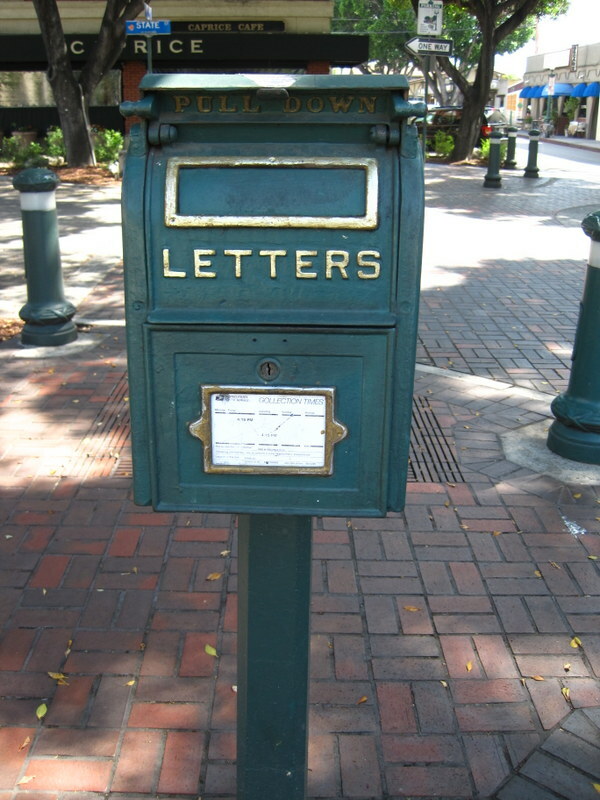 Eric spotted this antique letter box downtown. So charming. After a relaxed stroll around town, we were hot and in need of ice cream, and we wanted to hit up the restroom before we got back on the road. 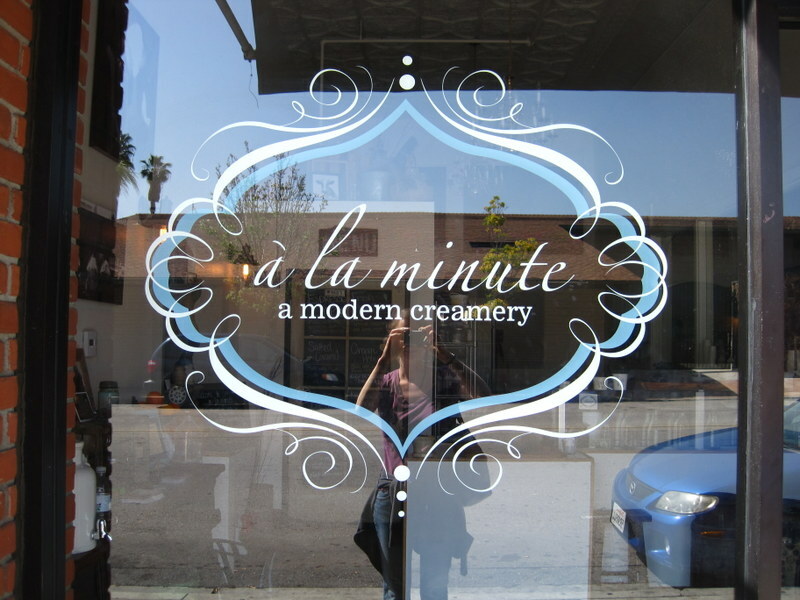 I had spotted this little creamery, so we doubled back to visit it. 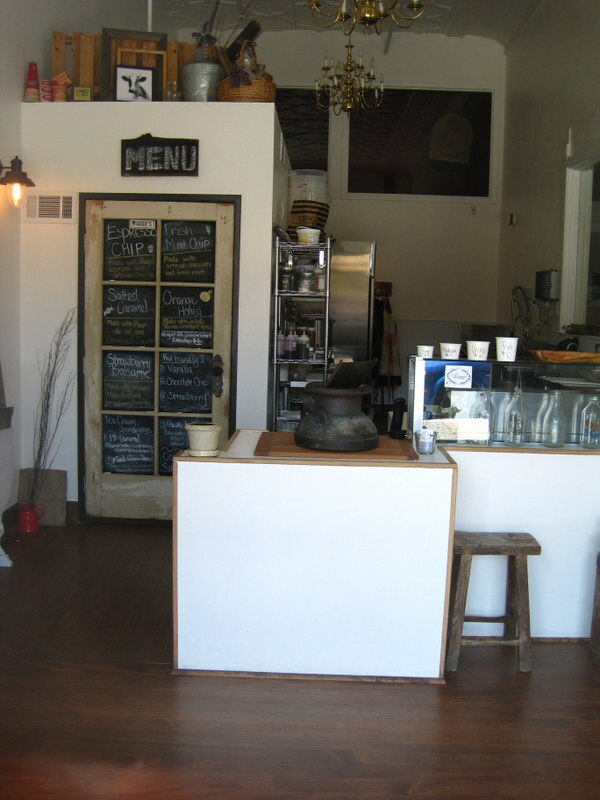 We were really impressed with their flavors, and it reminded us so much of Ici in Berkeley. Strawberry balsamic! Orange honey! It was tiny, adorable, and…closed. We were so sad! Here is the face of sadness, documenting the terrible blow of a closed ice cream parlor on a Sunday afternoon. It was only 87 degrees, but we were still in our hiking clothes, and we needed some refreshment. Daunted but determined, we carried on with our quest. I remembered that there was a Baskin-Robbins a few streets over, and, while it wasn’t our first choice, it was better than nothing, so we headed that way. When we got there, it was crazy crowded…and there was no restroom. We whipped out our phones and kept searching. Eric found a TCBY, so we drove off in a different direction to find it. The streets we drove down were gorgeous and studded with pretty Victorians. This served to assuage our pain when we drove right past the spot where the TCBY was supposed to be…and it did not exist. I found yet another frozen yogurt place on the phone, and we drove a bit further. This place also did not exist. At this point, we were beginning to feel like we were in the twilight zone. We pulled into a shopping center to get our bearings, and what should appear before my eyes but a frozen yogurt place! We drove closer to park the car and saw…that it was permanently closed. My favorite thing about the whole quest is that we were laughing hysterically about it. I am so glad for that. We were just going to run into a nearby grocery store when I found one more place on my phone: a frozen custard place. Frozen custard is, in my opinion, even better than ice cream or frozen yogurt. But the map was showing that it was sort of in the middle of a hospital complex. Not a likely story, but we decided to give it a whirl. And it did exist! 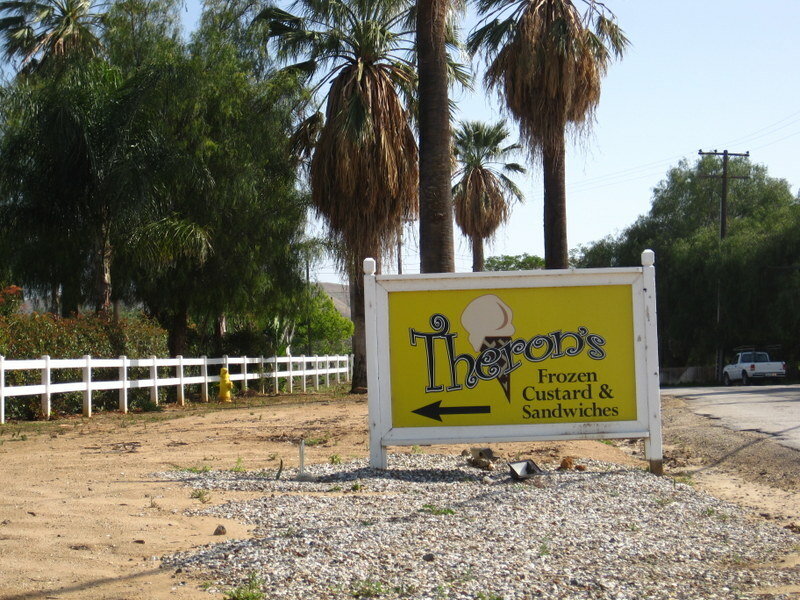 The world’s most perfect frozen custard place, with a restroom to boot! We both got a concrete and a big glass of water and sat out in the shade to enjoy it. I could not have imagined a more idyllic place to eat frozen custard. 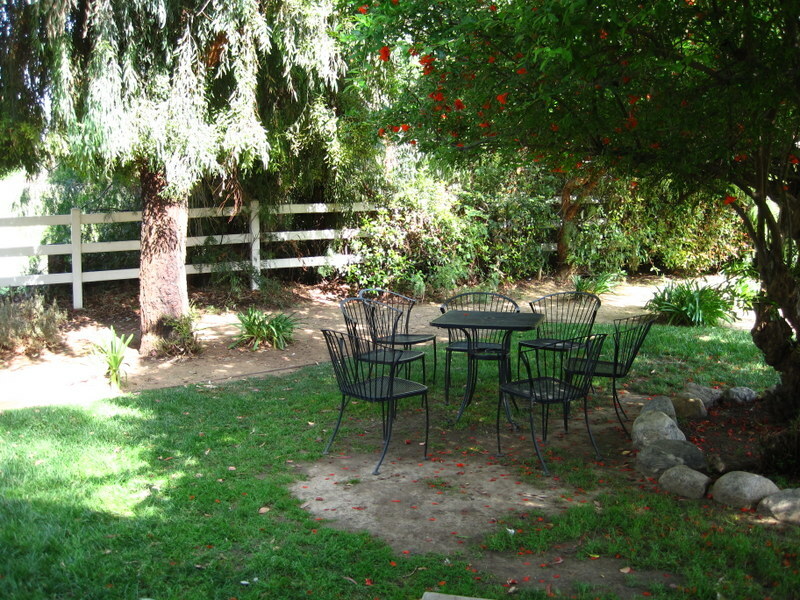 We sat at this sweet table in the shade, orange groves just behind us. This is proof that good things come to those who wait. And also to those who drive all over town looking for ice cream! Our wild goose chase just made this experience all the more wonderful. 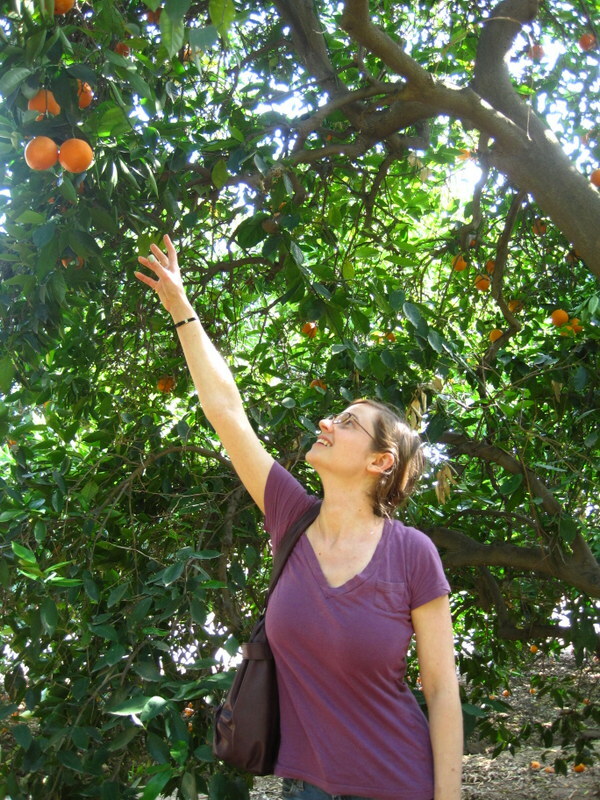 On our way back to the freeway, we stopped to look at the orange groves. They are such a huge part of Southern California history, and it made me so happy to see that some of them are still there. Even though the groves are not what they used to be, they live on in the spirit of the town. 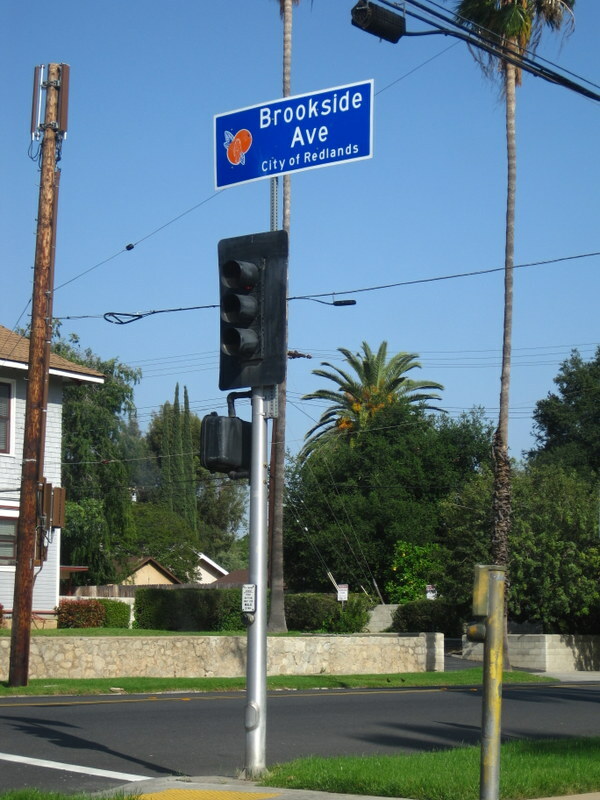 I loved the street signs, resplendent with oranges. On our way out of town, we took a quick spin through the other side of downtown, where we found this enormous amphitheater. 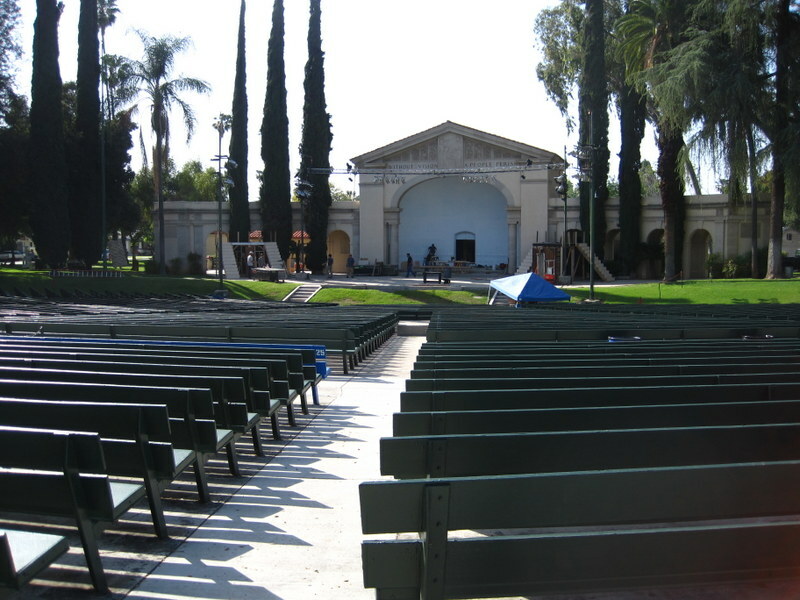 Redlands has a huge outdoor summer Shakespeare festival: awesome! When I got out to take a picture, I realized that they were building the sets! This theater nerd was very excited! Apparently, excited enough to not notice this solar flare. Oh well! Eric and I absolutely love to explore new places together, and Redlands was a special treat for us. We sort of randomly picked it out on the map as were heading back to LA, and it was such a fun and beautiful town. I’m so glad we stopped there, and I hope we can go back sometime soon, maybe for the Shakespeare festival! On our return trip from our honeymoon we stumbled across a state park that provided some of our favorite memories from that magical time together. I carry a picture of the two of us in front of a waterfall in that park. It’s been in my wallet for 32 years. I love that picture! And I love how magical moments like that can appear so unexpectedly. I am grateful for every single one of them! I really love those citrus signs; how cool would it be to have one hanging in the kitchen? 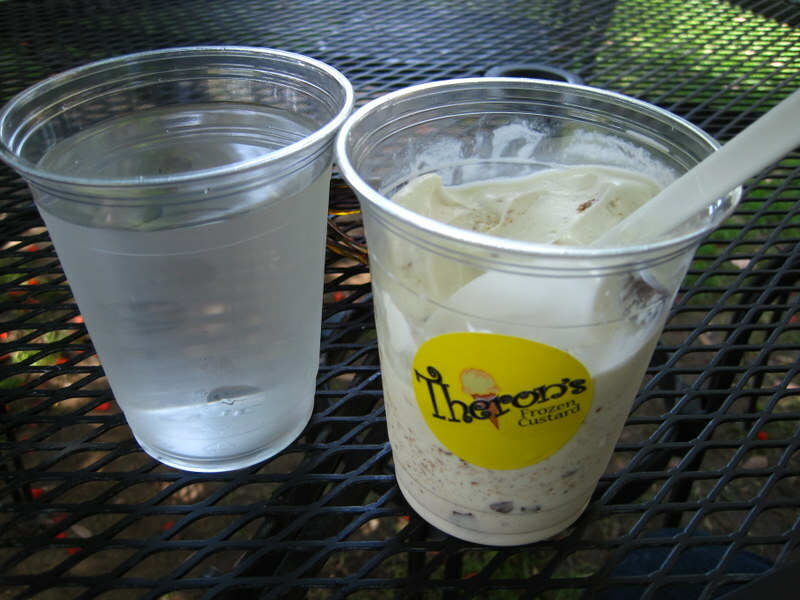 And I really like this story–ice cream (or frozen custard, which I’ve always loved, too) is something that I truly believe is worthy of a quest; for me, it might just be the Holy Grail. And THAT’S WHY….. you don’t look for an ice cream stand on a Sunday!!!! Yes, and I seem to recall that that’s also why you don’t eat ice cream in the car! After that experience, sounds like Ted Drewes should be on the agenda for the weekend in St. Louis. I am so glad we went!